Karl Marx. Marx, Karl, photograph. The Library of Congress. Family Rejection of the Historical for the Material. 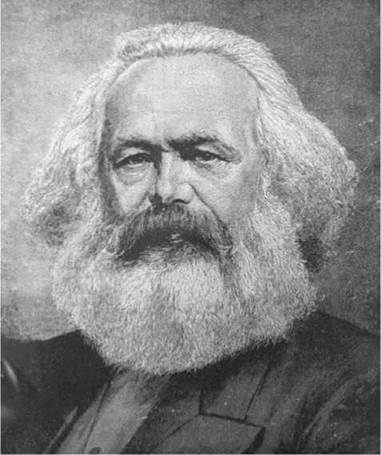 Karl Heinrich Marx was born on May 5, 1818, in the Prussian (today German) city of Trier. His father, Heinrich, was an attorney whose outlook on life followed the ideas of Enlightenment thinkers such as Voltaire. Both of Marx’s parents were descended from generations of rabbis; however, since Prussia barred Jews from holding public office, Heinrich Marx chose to undergo baptism, and to baptize his son as well. Marx got his high school education at a liberal school called the Friedrich Wilhelm Gymnasium. He proved adept at languages—eventually learning to read at least seven—but did poorly in history. Given that the philosophy he went on to found is sometimes known as ‘‘historical materialism,’’ this fact is not without irony. Graduating from school at age seventeen, Marx went on to the University of Bonn in 1835. After a year of lackluster performance, he transferred to the University of Berlin, studying philosophy and law. Young Hegelian. In Berlin he joined the ‘‘Doctor-klub,’’ a group of students interested in philosophy, especially the ideas of Gottfried Wilhelm Friedrich Hegel. Hegel’s dialectical theory views human progress as the result of a clash between opposing movements or social forces (the ‘‘thesis’’ and ‘‘antithesis’’), which eventually fuse into a ‘‘synthesis.’’ The avant-garde ‘‘Young Hegelians’’ in this club sought to apply Hegel’s theory to challenge the ruling institutions of European society, including the church. Editorship, Marriage, and Engels. In 1841, Marx received his doctorate after completing a dissertation on the ancient Greek philosophers Democritus and Epicurus. Unable to obtain a teaching position, he began contributing articles to a new liberal-radical Cologne newspaper, Die Rheinische Zeitung, and soon became the paper’s editor. His bold political commentary attracted great attention from the Prussian censors, who shut the paper down early in 1843. That June, Marx married Jenny von Westphalen after a seven-year engagement. She was the daughter of a baron who had been a tutor to the young Marx. The couple moved to Paris, a socialist center with a more permissive atmosphere, where Marx went to work on a journal called the German-French Yearbook. The publication collapsed after one issue, but through the project, Marx became acquainted with Friedrich Engels, the son of a cotton mill owner, who became his closest friend and lifelong collaborator. The two men met in the spring of 1844, and—though Marx was not at first wildly enthused with the rather brash young Engels—began working together not long thereafter. The Communist Manifesto and Eventual Statelessness. In January of 1845 Marx was expelled from Paris at the request of the Prussian government, because of two anti-Prussian essays he had published in a radical Paris newspaper. With his family, he went to Brussels, and Engels followed soon afterward. There, Marx began to organize among the working classes and wrote the books The Poverty of Philosophy (1847) and, with Engels, The German Ideology (published posthumously in 1932). The latter work is perhaps the fullest statement of Marx’s materialist theory of history as determined by economic conditions. At its congress in November of 1847, the London- based Communist League commissioned Marx and Engels to write its political program. Their statement, now known as The Communist Manifesto, was first published in pamphlet form in January of 1848. Here the theories of Marx and Engels appear in concise language with minimal jargon. The Manifesto declares that all history boils down to the struggles between classes. In the modern age, the primary class antagonism is between the oppressive ‘‘bourgeoisie,’’ the wealthy captains of industry, and the ‘‘proletariat,’’ particularly the urban poor. Marx and Engels predict that this struggle will intensify until the proletariat, organized internationally as a class, finally overthrows the bourgeoisie and builds a classless society. The Manifesto was intended to serve as a call for rebellion, not a model for communist government. As it happened, insurrections did erupt in Europe in 1848; ironically, they were mostly led by bourgeois nationalists, not the ‘‘workers of the world,’’ and all were violently suppressed. Forced to leave Belgium, Marx witnessed and reported on the revolutions in France and Germany, but was expelled from both countries as the uprisings were crushed. In 1849, he took refuge in London. He lived there the rest of his life, a citizen of no country. Capital and the Lack Thereof, Journalism, and the Study of Economics. During his first years in London, Marx spent most of his time in the reading room of the British Museum, studying economics. He worked as a journalist for the New York Daily Tribune and other papers, submitting hundreds of articles (including many actually written by Engels). The pay was poor, however, and Marx was often unable to feed and clothe his family properly. Three of his children died within a few years. However, he refused to accept more lucrative work, devoting himself to his writing and revolutionary activism. Later on, he received steady financial help from Engels, who worked his way up in his father’s business to support his friend. After the tremors of 1848, Marx expected a new round of revolutions at the next economic downturn. He wrote two long pamphlets on contemporary French history, The Class Struggles in France (1850) and the trenchant Eighteenth Brumaire of Louis Napoleon (1852). His most important writings, on economics, were large in magnitude and slow to appear. He published his first Contribution to the Critique of Political Economy in 1859. Only the first volume of his magnum opus, Capital (frequently referred to by its German title, Das Kapital), appeared in his lifetime, in 1867. The second and third volumes, extensively edited by Engels, were published in 1885 and 1894. Capital takes a systematic, scientific approach to studying the relations between capital and labor. Marx expanded on and critiqued the theories of economists such as Adam Smith and David Ricardo. His major contributions to social and economic thought—such as the theories of surplus value, alienation and exploitation of human labor, the means and relations of production, commodity fetishism, and the process by which global markets exacerbate class conflict—are all found in these volumes. His reasoning led him to the conclusion that the processes of capitalism will lead that system inevitably to its own collapse, out of which will emerge a socialist era. The First International: Building Consciousness. Marx was also actively engaged in bringing about that socialist era through the International Working Men’s Association, or the First International. From its inception in 1864, he assumed a leading role in this coalition of workers’ organizations from numerous countries and various political ideologies. Marx always maintained that a successful socialist revolution could only come at the right historical moment, after the workers had gradually achieved sufficient consciousness of their exploitation and their class solidarity. He opposed more militant factions, such as the anarchists led by Mikhail Bakunin, and energetically sought to establish international connections and consensus at the organization’s annual congresses. The movement grew to a peak membership of eight hundred thousand by the end of the 1860s but which declined when its general council moved from London to New York in 1872. Ill health and depression reduced Marx’s productivity in the last ten years of his life. His wife died in 1881, and his eldest daughter in January of 1883. He himself passed away only two months later. Thus, he did not survive to experience the triumph of his ideas among European democratic mass parties in the 1880s and 1890s. A great many of his works, including the final two volumes of Capital, were published posthumously, some as late as 1941. Friedrich Engels (1820-1895): A German philosopher and sociologist and coauthor with Marx of The Communist Manifesto. Charles Darwin (1809-1882): The British scientist known as the originator of the theory of evolution by natural selection. Charles Dickens (1812-1870): A British author of classic novels such as Great Expectations and David Copperfield. Harriet Beecher Stowe (1811-1896): An American abolitionist and author of Uncle Tom's Cabin. Abraham Lincoln (1809-1865): The American president during the Civil War, famous for abolishing slavery in the United States. State and Revolution (1917), a political text by Vladimir Lenin. Written in the midst of the Soviet revolution by its main leader, this pamphlet clarifies the approach the Bolsheviks would take in organizing a communist state. Pedagogy of the Oppressed (1968), an education text by Paulo Freire. This classic describes an innovative, classconscious approach to popular education, as developed among Brazilian adults. Selections from the Prison Notebooks (1971), a collection of essays and fragments by Antonio Gramsci. These are the most systematic writings of one of the twentieth century's most important Marxist thinkers. Marxism and Literary Criticism (1976), a literary theory text by Terry Eagleton. Eagleton's treatise is a seminal work of critical theory, describing a method for uncovering and analyzing the ideological underpinnings of literary texts. Some of the major influences on Marx’s thought include social thinkers of the Enlightenment, such as Jean-Jacques Rousseau; earlier political economists, notably Smith and Ricardo; Hegel, from whom Marx borrowed his dialectical method; Ludwig Feuerbach, who challenged the Christian assumptions in Hegel’s thought; and the French socialist-anarchist Pierre-Joseph Proudhon, who attacked the concept of private property. Some scholars have detected the influence of classical Greek thinkers such as Aristotle on Marx’s relentless rationality. One more influence not to be ignored is that of Friedrich Engels, a notable author himself, who had already written The Condition of the Working Class in England (1844) before joining forces with Marx. The Power of the Working Class. Marx’s work is notable for its emphasis on the power held by the working class in a society. For centuries, and in many ways still today, those who performed the most laborious tasks— farmers, factory workers, and low-level tradespeople—have been given little say in the operation of the government under which they live. Marx pointed out that these workers actually produce the basic materials of value for a society and were therefore an important resource that was being exploited instead of being rewarded. Although these workers had little official power, Marx argued that they potentially held economic power through their numbers and through their ability to produce—or through the conscious decision not to produce—goods. Coherence and Consistency. One remarkable characteristic of Karl Marx’s writings is the consistency of philosophical perspective and premise. Many of the specifics of his political prescriptions changed over time; his program for the First International, for example, differed significantly from the Communist Manifesto, especially in its emphasis on labor unions as a vehicle for working-class empowerment. However, it is generally acknowledged that Marx’s mature conclusions had been formulated as early as the 1840s, in good part through his famous meetings with Engels. Worldwide Impact Karl Marx’s ideas have had a stunningly deep impact—perhaps greater than that of any other single political thinker of the modern age—around the world and in many fields of human endeavor. The language, questions, assertions, and predictions in his prose have entered the standard discourse of politics, economics, history, and cultural criticism. His theory is cited just as often by its opponents as by its adherents. Among the countless Marxist or neo-Marxist thinkers and writers of the twentieth century, some of the most prominent have included Antonio Gramsci, Jean-Paul Sartre, Theodor Adorno, Herbert Marcuse (and other theorists of the Frankfurt School), and the historians E. P. Thompson and Eric Hobsbawm. Marxian formulations, such as his emphasis on ideology and false consciousness, are fundamental to the intersecting bodies of late twentieth-century scholarship known as critical theory. Lenin, Mao, and Communism. Last but not least, the theories of Karl Marx have profoundly affected a large proportion of the world’s population through their incorporation into the communist revolutions in Russia, China, and elsewhere. Marx himself never drew up a clear outline for communist governance, much less revolution as such; he saw a revolution as inevitable, but also imagined that it would be predicated on the growth of critical consciousness among the workers of the world. However, the major leaders of the Bolshevik Revolution, Vladimir I. Lenin and Leon Trotsky, both viewed themselves as heirs to Marx. Later on, a rift developed between them, and to this day Leninist and Trotskyist political parties spar over their conflicting interpretations of Marx. Mao Zedong also claimed a Marxist lineage but developed a Chinese variant in which peasants, rather than urban industrial workers, were the main class forces in the revolution. At the high-water mark of Third World socialism and communism, nearly half the world’s population lived under governments that claimed allegiance to the principles of Karl Marx. Karl Marx did not live to witness the profound political and social impact of his thinking. The immediate reception of most of his writings was modest. For example, some people erroneously believe that the uprisings of 1848 sprang more or less directly from The Communist Manifesto, but at the time of its publication, it was not widely read. In the decades after Marx’s death, however, larger political parties on the left, such as Germany’s Social Democratic Party, began to adopt a Marxist orientation. The Russian Revolution of 1917, which took place during World War I (1914-1918), brought a great deal more attention, both positive and negative, to Marx’s work. The Communist Manifesto. The Communist Manifesto, a relatively short pamphlet and surely Marx’s most-read work, has rarely failed to spark debate. One debate surrounding this text has been its actual status as a piece of literature. As long ago as 1901—four years before the first major revolution in Russia and sixteen years before its successful progeny, the 1917 Russian Revolution inspired by Marx’s thought—prominent Polish socialist Karl Kautsky observed that the document offered a useful guide for socialist revolutionaries, but warned too that ‘‘it is no gospel, no bible, as it has been called, the words of which are holy words, but an historic document that should be subjected to criticism.’’ In a very different register, key social thinker Joseph Schumpeter argued that ‘‘in one important sense, Marxism is a religion. To the believer it presents, first, a system of ultimate ends that embody the meaning of life and are absolute standards by which to judge events and actions; and, secondly, a guide to those ends, which implies a plan of salvation and the indication of the evil from which mankind, or a chosen section of mankind, is to be saved.’’ For Schumpeter and for countless others, Marx was a prophet of sorts—and like most prophets throughout history, prone both to important inaccuracies and to being used for a wide variety of political ends. The End of History and Marx in the Twenty-first Century. Today, Marx is universally recognized as one of the most important thinkers of the modern era. Alongside such giants as Charles Darwin and Sigmund Freud, he expressed ideas that changed the world immensely. Although his analysis of capitalism remains powerfully astute, many of his expectations and predictions have not been borne out by subsequent history. For example, he thought that the contradictions of capitalism would quickly intensify, not anticipating the rise of labor regulations, pensions, and other social reforms in market societies. More importantly still, he did not see how a ‘‘consumer society’’ would develop to help relieve the tension caused by the excess inherent in the system of capitalism. He also failed to anticipate that his ‘‘dictatorship of the proletariat,’’ when it took shape in revolutionary societies like the Soviet Union, could lead to the shrinking of human freedoms rather than to their expansion. Most recent interpretations of Marx have focused on how his ideas could be transferred to or translated for a post-Communist world. After the fall of the ‘‘iron curtain’’ separating the Soviet bloc from the West, and the discrediting of Communism as a mode of government, many observers have argued that socialist, Marxist thought is no longer even possible. Famously, U.S. government policy analyst Francis Fukuyama proclaimed in 1989 an ‘‘End of History,’’ arguing that it was no longer possible to even imagine a historical alternative to capitalist democracy. He wrote, ‘‘The triumph of the West, of the Western idea, is evident first of all in the total exhaustion of viable systematic alternatives to Western liberalism ... since the egalitarianism of modern America represents the essential achievement of the classless society envisioned by Marx.’’ This is, for good reason, a hotly contested—and, some argue, a hopelessly naive or even willfully cynical—perspective. On the other end of the spectrum, though, a neo-Marxism has emerged, represented by thinkers like Slovenian psychoanalyst and philosopher Slavoj Zizek. Zizek makes the case that a careful reading of Marx must make us suspicious of today’s ‘‘humanitarian’’ capitalists such as Bill Gates and George Soros, arguing that ‘‘the same Soros [for example] who gives millions to fund education has ruined the lives of thousands thanks to his financial speculations and in doing so created the conditions for the rise of the intolerance he denounces.’’ For Zizek and many other thinkers on the Left today, Marx’s thought has not only survived the death of Soviet communism, but is perhaps more vital today than ever before. 1. Evaluate the prose style of The Communist Manifesto. How do the tone and language help achieve the purposes of the piece? 2. Define and summarize one of the key concepts of Marx’s theory of economics, such as ‘‘surplus value.’’ Can you find an example of this concept in the real world? 3. Research the state of industrial development in Europe at the time Marx began his career. What were the conditions that motivated his critique of capitalism? 4. What differences do you see between the ideas in Marx’s own writing and the way his ideas were used by Lenin and Stalin in building the Soviet Union? 5. Research the history of socialism before Marx. Where does the term come from, and what was original in Marx’s conceptualization of socialism? Appelbaum, Richard P. Karl Marx. Beverly Hills, Calif.: Sage, 1988. Berlin, Isaiah. Karl Marx: His Life and Environment. 4th ed. New York: Oxford University Press, 1978. Bloch, Ernst. On Karl Marx. New York: Herder and Herder, 1971. Carver, Terrell. Marx and Engels: The Intellectual Relationship. Bloomington: Indiana University Press, 1983. Collins, Henry. Karl Marx and the British Labour Movement: Years of the First International. New York: St. Martin’s, 1965. Eubanks, Cecil L. Karl Marx and Friedrich Engels: An Analytical Bibliography. 2nd ed. New York: Garland, 1984. Hamilton, Richard F. The Bourgeois Epoch: Marx and Engels on Britain, France, and Germany. Chapel Hill: University of North Carolina Press, 1991. Lefebvre, Henri. The Sociology of Marx. New York: Columbia University Press, 1982. McLellan, David. Karl Marx: His Life and Thought. New York: Harper and Row, 1973. Nicolaievsky, Boris, and Otto Maenchen-Helfen. Karl Marx: Man and Fighter. London: Methuen, 1936. Prawer, Siegbert S. Karl Marx and World Literature. Oxford: Clarendon Press, 1976. Schumpeter, Joseph. Capitalism, Socialism, and Democracy. New York: Harper Perennial, 1962. Sowell, Thomas. Marxism, Philosophy, and Economics. New York: Morrow, 1985. Tonnies, Ferdinand. Karl Marx, His Life and Teachings. East Lansing: Michigan State University Press, 1974. Fukuyama, Francis. ‘‘The End of History?’’ National Interest, Summer 1989. Kautsky, Karl. ‘‘To What Extent Is the Communist Manifesto Obsolete?’’ Leipziger Volkszeitung, 1904. Zizek, Slavoj. ‘‘Nobody Has to Be Vile’’. London Review of Books, April 6, 2006.